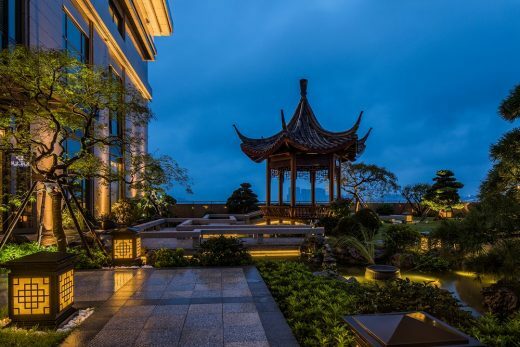 As one of the seven ancient capitals in China, Hangzhou has a long history and profound background with picturesque scenery and numerous celebrities. It is known as “paradise on earth” for the fascinating characteristics. The brand “Diaoyutai”, originated from the ancient Diaoyutai scenic spot outside of Beijing Fuchengmen, which had a history of more than 800 years, is the heritage of Diaoyutai State Guesthouse. Its sites have always been very focused on the accumulation of history and culture. 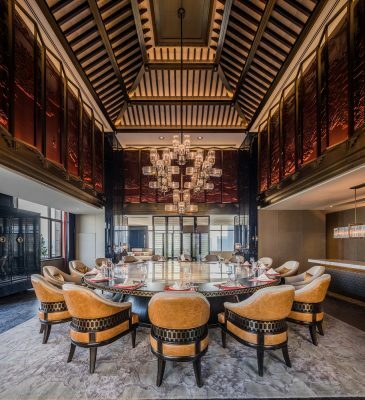 As an esteemed world class hotel brand grounded in Chinese philosophy and aesthetics, Diaoyutai Hotel is designed to create the mansion experience with Chinese spirit and international style. 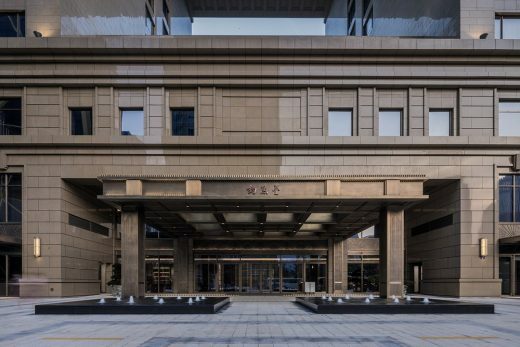 At the beginning of completion, Diaoyutai Hotel Hangzhou was mainly for the 2016 G20 summit. After the summit, it is gradually known by more people for the temperament of Chinese mansion. It has elegant taste, and it is familiar with both China and the world with a broad mind, which is called as “Downtown Abbey” beside the Qiantang River. 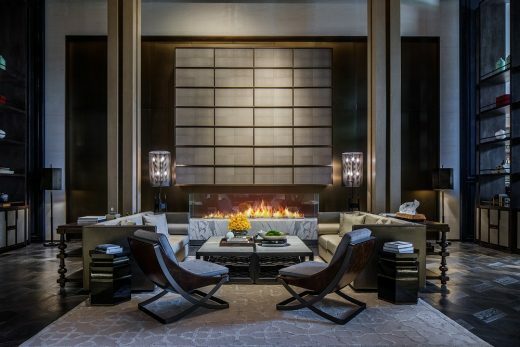 When guest entering the hotel, lobby is the first space, acting as “living room” of the mansion. Inspired by the Chinese traditional courtyard and garden, CCD team used the concept of courtyard for reference in the plan layout and implied the structural layout of Beijing Siheyuan and “four sides water returning to the main hall of the houses” ofHui-style architecture. The front side of the house is the all-day dining restaurant; the right side is the reception desk; and the left side is the lobby lounge area. By the use of the traditional courtyard layout, the progressive layers of space is designed, forming the multi-level layout of “three-entry and two-corridor” in the vertical axis. Landscape techniques with oriental aesthetic features are reflected here, such as opposite scenery and enframed scenery. Walking through the layers of space, guests can appreciate the various atmosphere and subtle differences of each space. Gradually toward the towering courtyard in the center, beautiful natural scenery outside is reflected on the French windows, creating a magnificent space and vigor. 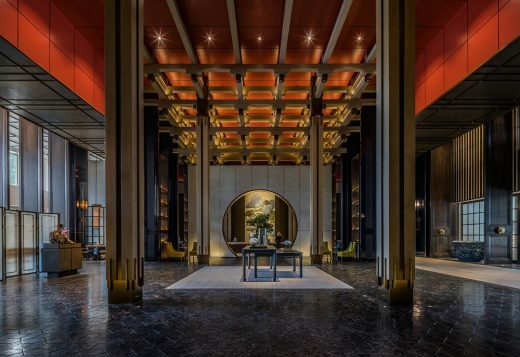 The lobby with function of “living room” is designed as a three-entry hall, where the rest area for both nostalgic and ornamental purposes along two sides of the entrance is the first entry; through the corridor, the central caisson courtyard with an abstract Chinese style pavilion in the center is the second entry; the third entry is the lobby bar (The Lounge)and Pinjurestaurant outside the window; the lobby bar acts as the hotel’s exclusive back garden.Through the third entry, guests can enjoy the rocks and ancient pine, which form a unique elegance of landscape. 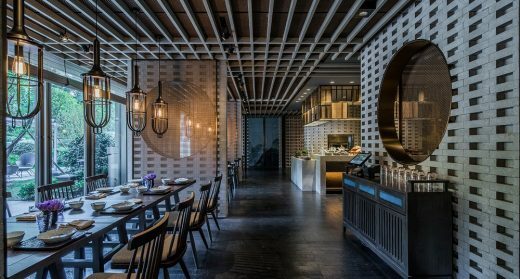 Adhering to the concept of integration of Chinese and Western, banquet hall is designed by modern means, interpreting an ultimate flavor of the freehand space in a restrained way. The main materials used in the hard surface include stone of light blue tone and gray and blue wood. 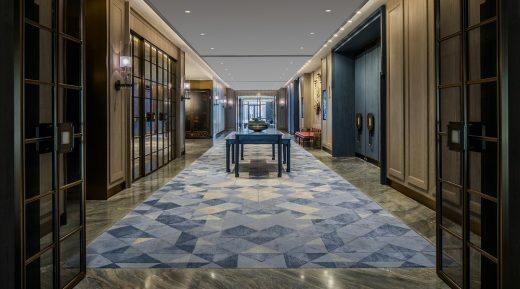 With a supplement of warm white leather, they are distributed on the long path of banquet front hall, where the blue diamond-shaped carpet jumps into the eye, beginning to describe the space mark by a unique temperament, which can either be cold or warm. 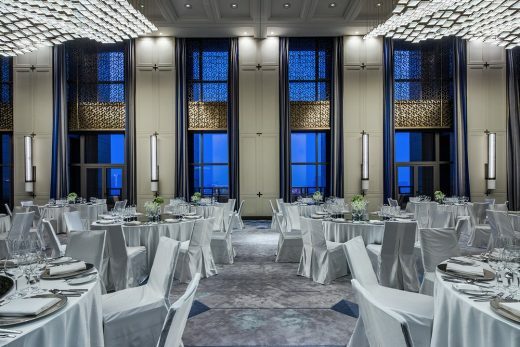 Differing from the general banquet hall with golden light and sumptuous decoration, it adds a fresh and elegant temperament to form a new look. Warm beige leather is gently applied in the inside wall of the hall, where metal ornaments are embedded. 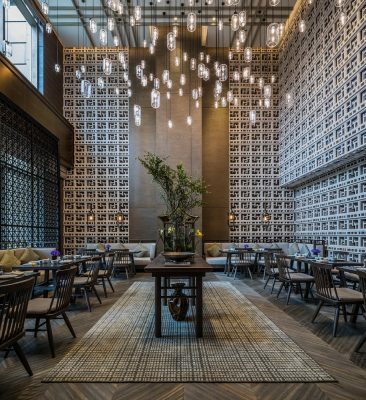 The lamp wall up to 2200 height enriches the space language, and the ceiling chandeliers in the form of wave over the air are just like the sparkling ripples of Qiantang River. The riverside panoramic glass pane is extracted from the cultural elements of ancient Hangzhou. It reminds people of the old memory of alley and windowsill. Culture is filled in the space. Exploring changes from the subtle details, the boardroom is no longer a rigorous gesture with a unique ingenuity of the orange-red color, where Chinese calligraphy is vertically hanging on the wall, and black and white ink based picture of the West Lake and red cedar is in the opposite wall. Together with curtains and carpet, it is a very interesting interpretation of subtle difference beauty in the space with different colors as dark red, crimson, crimson, orange red, and different surface textures. Walking from the banquet hall through the outdoor platform, multi-function hall stands here as a single building. The small hall is mainly used for meeting, as a continuation of the banquet hall in design concept, where warm white leather and blue carpet interpret the entire space; a little bit of light is vaguely revealed through the retro glass door; and a bar is set for guests to sit around and enjoy the slow pace of leisure after meeting. Going upstairs along the spiral stairs, it is a recreation hall with good scenery from each window. The grass and wood as well as sunshine outside the window make it a delicate and comfortable space, where the hustle and bustle of the city is far away. 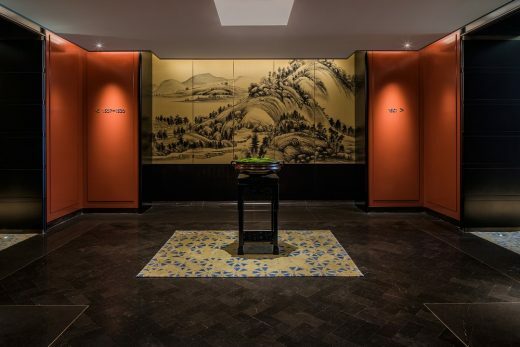 The design concept of guestrooms in Diaoyutai Hotel Hangzhou is originated from the oriental ambassador’s mansion, which is a blend of Chinese and Western styles, because of the diplomat’s travelling experience around different countries. There is no standard hotel feeling for the design of the guestroom. 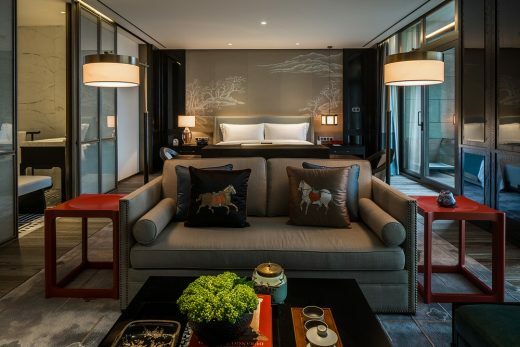 The 162 guestrooms are customized and perfectly show Jiangnan’sconnotation and extension to contemporary living space, provide the guests with a dream place to search for China’s charm. The layout and space organization of guestrooms are based on the architecture of Jiangnangardens, where great attention is paid to the extension, infiltration and separation of spaces. The guestrooms are of more than 60 square meters, and each room has an independent hallway, independent toilet and walk-in cloakroom. In the bedroom, sleeping area, working area and reception area are separated according to the functional relationship. 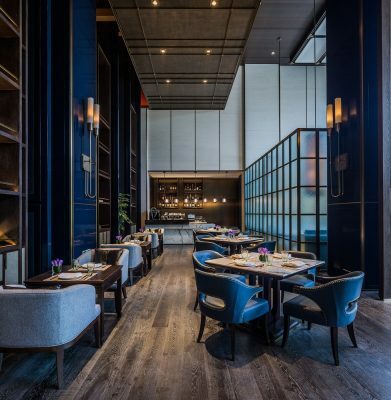 Chinese and Western compatible furniture, black paint screen, silk cloth and rust mirror, etc., all together make a rich spatial sense and create a flexible and vivid layout for the space. Walk-in cloakroom is equipped with three full-length mirrors on three sides, user-friendly wardrobe and dresser for dressing and making up. Floor paving of the toilet is inspired by the delicate way of brick pavement in Jiangnan garden; wash table is in the form of independent Chinese furniture with ingenuity; traditional and innovative design elements, such as handcrafted copper pot, contemporary German faucet, applique rust mirror and crystal glass lampposts, collide with each other,integrated as a whole. Copper wire as the close up of the ceiling, and simple treatment to the narrow and long air outlet, achieves smooth and generous effect. Furniture in the guestrooms is elegant in style;the plain color sofa is concise and comfortable; the solid wood furniture is with great details; the porcelain, lacquer ware, floricultureand other decorationsare in exquisite Chinesetechnology. The fusion of Western-style mini-bar and Chinese-style large cabinet gives the guestroom an atmosphere of humanism. Most excellent designers advocate talking with images, because a good design can be understood by people without too much word explanation. 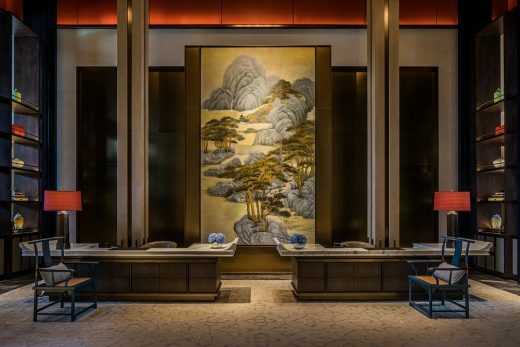 CCD has always adhered to this philosophy, so the elements of traditional Chinese culture can be found in the hotel, such as the moon gate, recessed-leg table with everted flanges, round-backed armchair, sedan chair, octagonal window, lantern, green plants, etc. In the meanwhile, Western-style modern furniture also plays an important role. What ethnic is what worldwide; it is a hotel of international style. 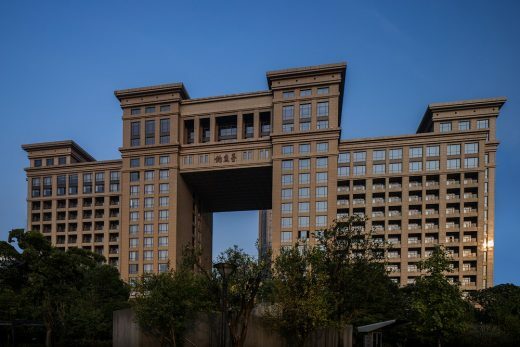 The hotel is located in the core area of Hangzhou CBD, alongside Qiantang River. Once open the door, you can walk into the riverfront landscape and enjoy the wonderful scenery of the city. 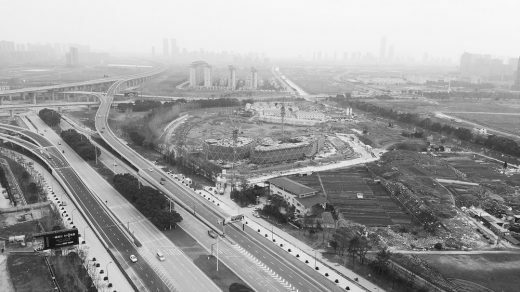 The site area of the hotel is 15,600 square meters, construction area is 96,900 square meters, of which the ground area is 54,600 square meters and underground area is 42,300 square meters; The building height is 73.4 meters, including 4storeys underground and 16 storeys on the ground. The hotel has 162 guestrooms, including 91 rooms with river view, and 56 of them have spacious balconies with outdoor river view. The Lounge has 145 seats, with ceiling of 2 storied high and large viewing French window. Pinju Hangzhou Chinese restaurant has 120 seats and separate outdoor dining area (with 20 seats). Royal Court Chinese Restaurant is located on the top floor of the hotel, and it has 9 private rooms with excellent viewing angle. Sky Ballroom banquet hall has an area of 300 square meters, with independent outdoor viewing balcony. There is a 20 meters long swimming pool, with independent dressing rooms for men and women, equipped with facilities as steam, sauna, experiential bath, etc.. There is a fitness center which is 155 square meters large, equipped with a yoga room of 25 square meters.